Pop Quiz: High or Low? It’s fun to buy things for people. But you know what’s especially fun? To be able to track down an item for a client that fits his or her budget, when they previously believed their preferred “look” was out of reach. Sometimes it is, but usually it’s not. Take these three items below, for example. A fancy settee, a glamorous side table, and a graphic rug. All are truly good quality items, which is important (because when you find a beautiful rug for $500, it’s worth $5 if it falls apart on you), but some will set you back a lot less than the others. Either way, score any of these and you’re on your way to a beautiful room. Can you tell which is the “high” and which is the “low”? If you can, respond in the comments. I’ll post the answers later this week! Here are the rugs: which is less per square foot, but no less stylish? 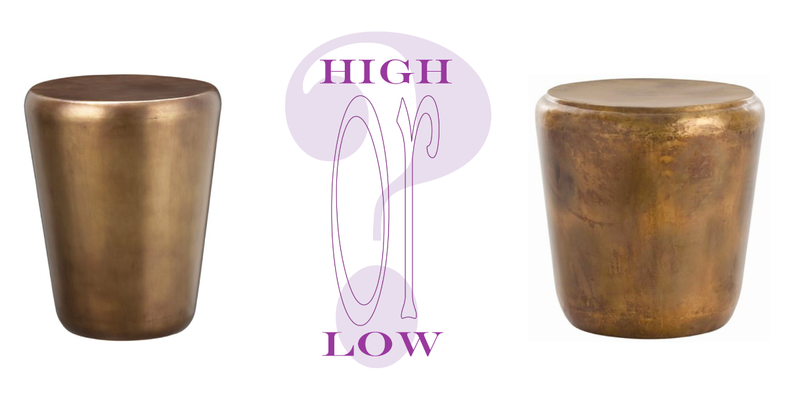 Here are the side tables: how much green are you willing to spend for your bronze? And here are the settees: one costs a lot more money, but they both only seat two.